Outdoor living is on the rise and designers are responding by incorporating outdoor kitchens as noteworthy as their indoor counterparts. Virtually all of Linda Sonders’s clients with single-family homes have outdoor kitchens, such as this one she designed in collaboration with MHK Architecture, Waterside Builders and Architectural Land Design. Outdoor living has become increasingly important in many people’s lives. 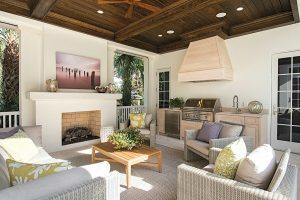 As such, designers are creating exterior spaces that can, at times, rival those inside with cooking areas that include built-in appliances, sinks and sometimes even islands and ventilation hoods and seating/lounging areas that include fireplaces and televisions. Designed by Jeremy McFarland, this custom home features two outdoor cooking areas. The screened porch has a built-in grill with ventilation hood, side burner and stainless steel backsplash, two undercounter refrigerators, a sink, a pull-out trash and plenty of storage and countertop space. All of these sit adjacent to the dining table and seating area with a fireplace and television. Heaters in the ceiling provide warmth on chilly days. The second cooking area, which features a wood-burning pizza oven and fire pit, is an open-air space positioned closer to the lake. 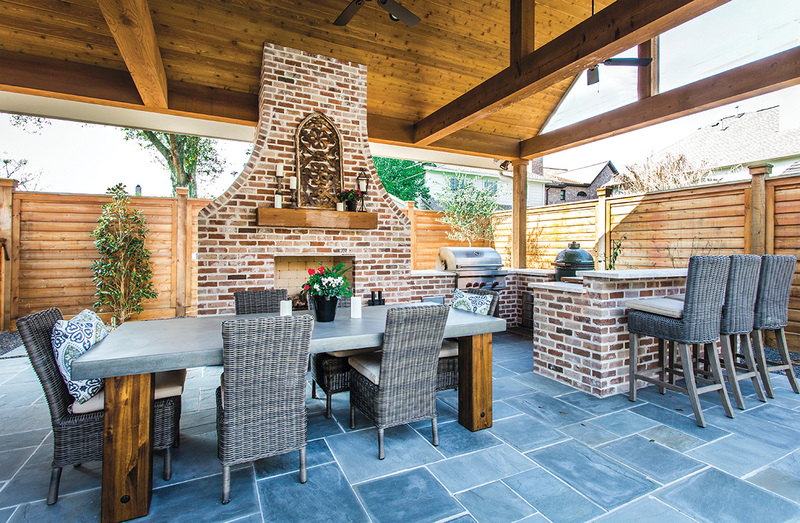 And outdoor spaces aren’t just for warmer climates, as proven by Amy Mangold, AIA/principal architect/partner, Scott Simpson Builders, in Northbrook, IL. 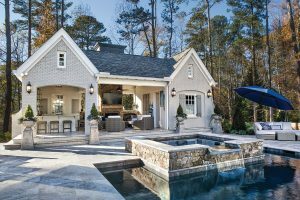 In recent years, she indicates, there hasn’t been a client who hasn’t wanted to focus on some sort of exterior living space, which, in addition to kitchens, can also include terraces, pools and spas. 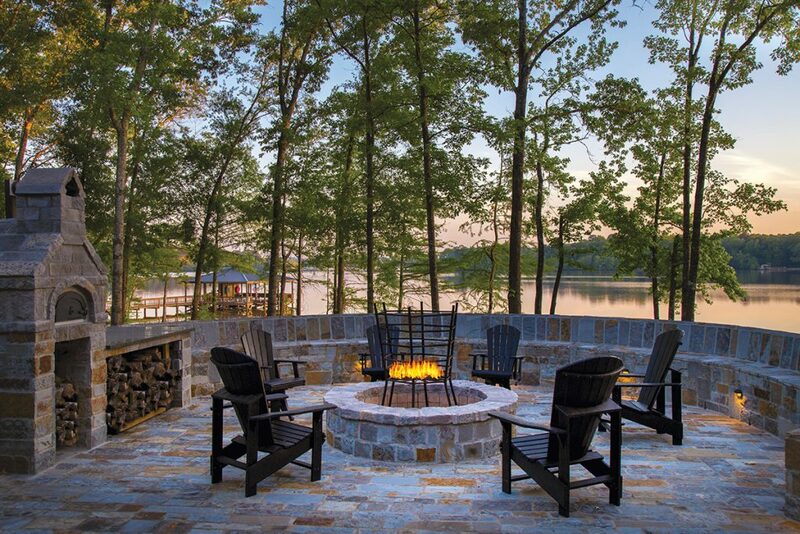 This lake home, where Michelle Tumlin collaborated with Geschke Group Architecture and C&A Builders, showcases how an outdoor kitchen can bring the heart of the home outside. Material choices, such as the limestone countertop and stonework, reflect the overall style of the home, while appliance selections add luxury, including a grill with sideburner, multiple smokers, refrigeration, ice maker, warming drawer, sink and stainless steel drawers. Smart home features from Control4 add fun and functional technology. Like indoor spaces, finances heavily influence the design of any outdoor kitchen. 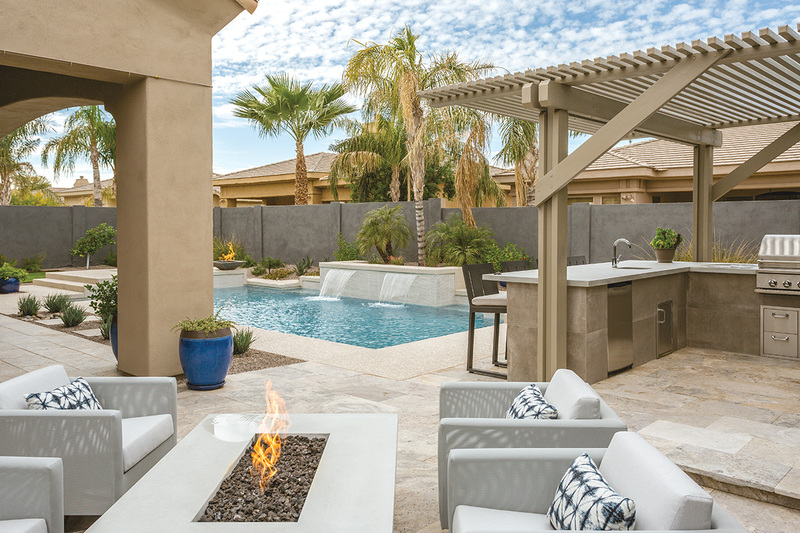 For McFarland, homeowners with high-end budgets are still including ‘the works,’ such as a recent custom home that actually features two outdoor cooking areas. The screened porch has a built-in grill with ventilation hood, side burner and stainless steel backsplash, two undercounter refrigerators, a sink, a pull-out trash and plenty of storage and countertop space fashioned from granite…all of which sits adjacent to the dining table and seating area with a fireplace and television. Heaters in the ceiling add warmth on chilly days. The second cooking area, which features a wood-burning pizza oven and fire pit, is an open-air space positioned closer to the lake. However, he also sees some clients pulling back a bit and downsizing their outdoor spaces. McFarland also notes that, in general, outdoor, or ‘summer,’ kitchens don’t need to be as spacious as their indoor counterparts because people use them differently. For Sonders, the only real must-haves are a great grill and a sink. But when budgets allow, she’ll add undercounter refrigerators, ice makers and side burners. The Florida designer also uses more traditional kitchen cabinetry, rather than stainless steel cabinets or a stucco or stone surround, while countertops are often shellstone, ‘Black Vermont’ stone or granite, frequently in Thunder White. 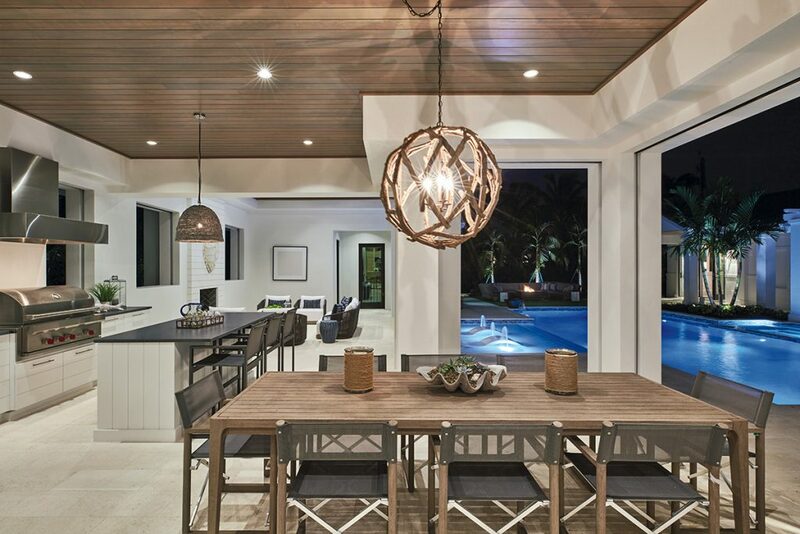 “I think the more organic nature of cabinetry is more fitting so it feels like an extension of the indoor space, which it actually is during the winter months in South Florida,” she says. Cabinetry, however, must be water- and insect-proof, so she often turns to composite box materials such as Starboard, accented with long-lasting door elements like teak, cedar and cypress. Or, she will also use NatureKast cabinets. “They have wonderful wood-looking doors and panels that look authentic, but are a fully durable composite material,” she notes. Many of Shannon Taylor’s clients have cooked on simple built-in grills for a while. But now many are looking to up the ante with their outdoor spaces, including this homeowner who wanted an outdoor kitchen, complete with a beverage refrigerator, ice maker and sink. 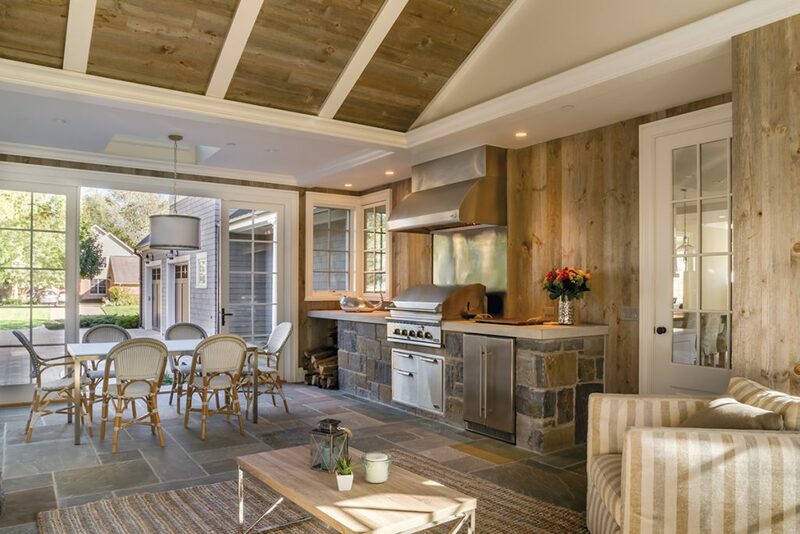 Cooking is handled outside the immediate kitchen area and an adjacent seating area with a fireplace and television gives guests a place to lounge. Tumlin’s clients often opt for fully functioning outdoor kitchens. ‘Must-haves’ include smokers, stainless steel sinks and faucets, refrigeration, weatherproof storage, plentiful lighting for evening cooking and, of course, grills “that can do just about anything,” she says. Additional elements often include pizza ovens and ice makers, along with comfortable seating. “Let’s not forget combining dining areas, fireplaces/fire pits, music and outdoor TVs to linger a little longer in the outdoors,” she adds. 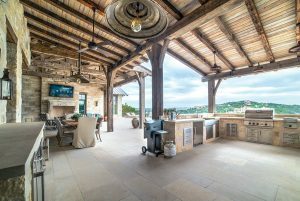 Many of these elements – such as a grill with side burner, multiple smokers, refrigeration, ice maker, warming drawer, sink and stainless steel storage drawers – were included in a recent outdoor kitchen on Lake Travis where the homeowners wanted their outdoor area to be one cohesive space for entertaining. Material choices, such as the Lueders limestone countertop and stonework, reflect the overall style of the home. An added luxury is smart home features via Control4. From inside the home, or from a smart phone or tablet anywhere in the world, the homeowners can control and manage virtually every aspect of their home, such as lighting, HVAC, security, surveillance and audio/visual, which includes streaming music to the outdoor living space – one of 23 zones throughout the home. 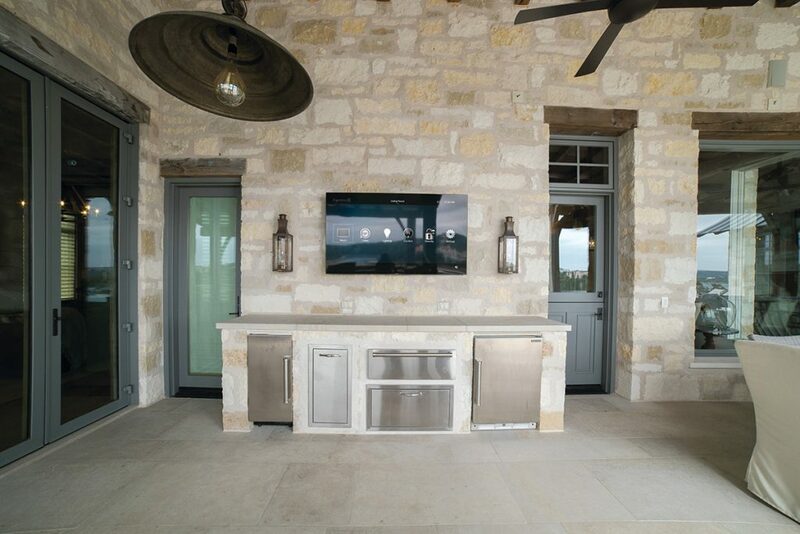 A video distribution system utilizes screens up to 85″ in 18 zones, including one in the outdoor kitchen. Like Tumlin, Ellefson’s clients often look for complete cooking spaces similar to what they might have indoors. Ellinor Ellefson’s clients often want complete outdoor cooking spaces, such as this kitchen where the designer included a refrigerator, grill, sink and seating at the single-level countertop. They also often trend toward a contemporary design style, where materials such as concrete for countertops, as in this space, are particularly popular. 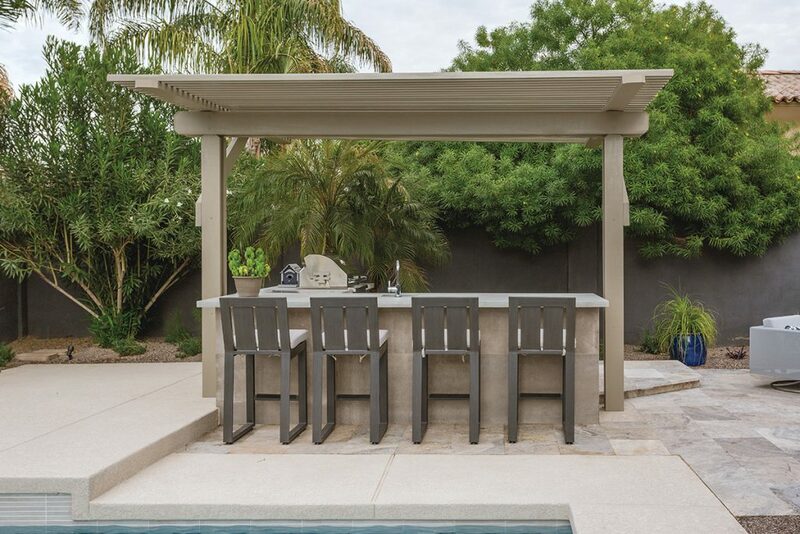 Many of Ellefson’s outdoor spaces also trend toward a contemporary design style where materials such as concrete for countertops are particularly popular. In fact, poured concrete was the countertop of choice in one recent project where she renovated the exterior space to complement the newly remodeled interior. “Now the indoor and outdoor spaces really flow together,” she says, noting their shared modern design style. The designer added some shade, another critical element given her Arizona location, and finished the space with travertine tiles for the floor. Like Ellefson, Taylor’s clients have cooked on simple built-in grills for a while. 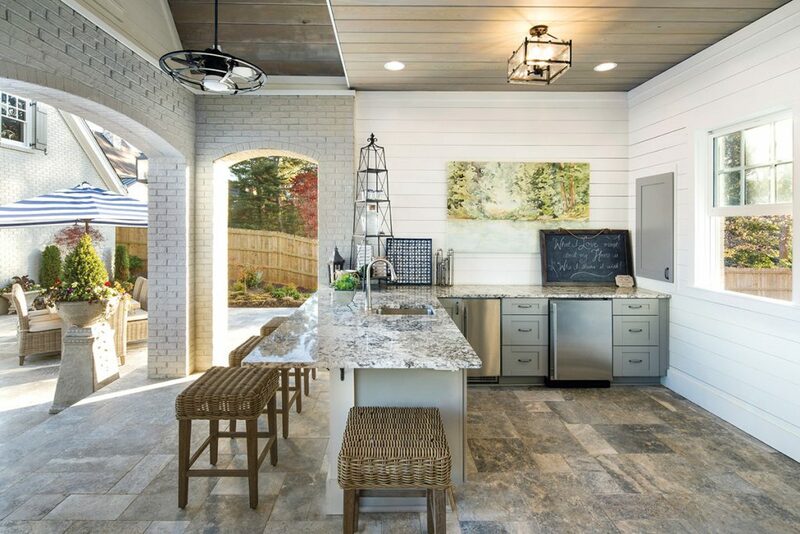 But now many are looking to up the ante and the designer has noticed the trend for outdoor kitchens is beginning to catch on, especially with clients who have pool houses and want an outdoor kitchen or kitchenette for entertaining. 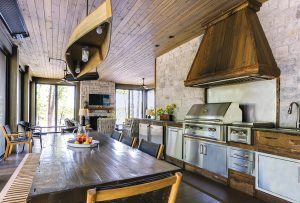 When Jeremy McFarland designs a summer kitchen, he is cognizant of how its location and amenities will affect views from inside the home. For this home, he positioned the outdoor kitchen off to one side, thereby allowing the nearby pool to be the focal point as viewed from inside. 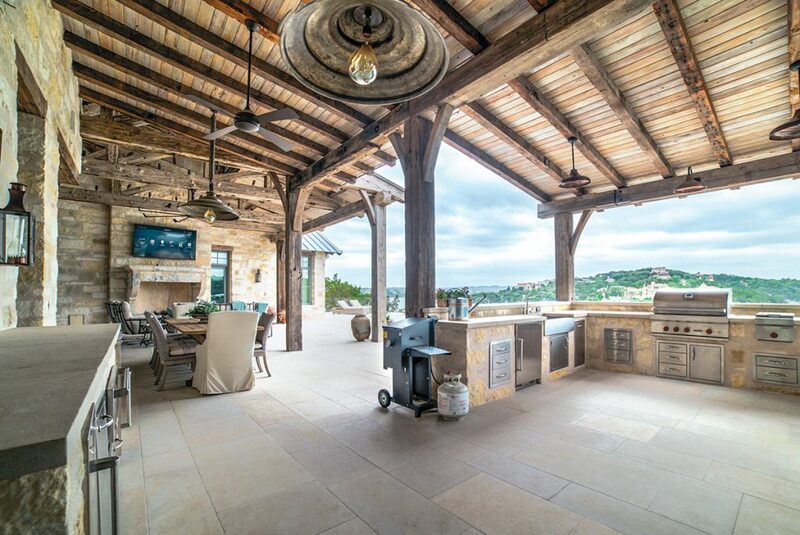 Essentials in many of the outdoor cooking spaces Taylor designs include a grill built into a stone surround, much like a fireplace. Cabinets are usually stainless steel and countertops are natural stone. The latter was the material of choice for a recent pool house kitchen where granite serves as a durable countertop work surface. 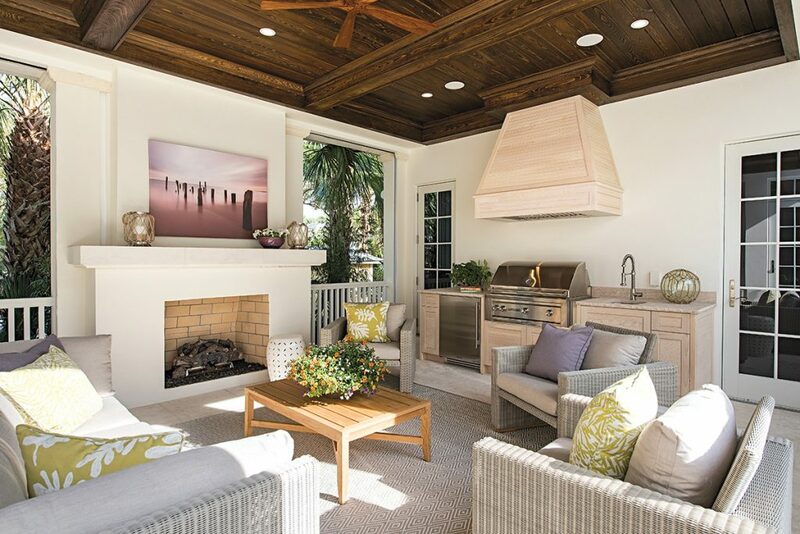 In this case, the designer opted for more traditional cabinetry since it was protected by the roof. And, while the structure is fully open on one side, Taylor designed the space so it could be fully enclosed in the future, if needed. Appliances include an ice maker – which was a ‘must have’ for these clients – a small beverage refrigerator and a sink. Cooking is handled outside the immediate kitchen area to eliminate any ventilation issues associated with smoke. Within the pool house, Taylor also included an adjacent seating area with a fireplace and television. A ceiling fan overhead keeps air moving and guests comfortable. Given Mangold’s northern locale, outdoor living spaces often start with a roof. Adding a fireplace and infrared heat in the ceiling further extends enjoyment opportunities so homeowners can use the space from the end of April through Halloween. Linda Sonders often uses more traditional kitchen cabinetry, such as in this space designed in collaboration with Arcadia Design and Waterside Builders, rather than stainless steel cabinets or a stucco or stone surround so the space feels like an extension of the indoors. Other ‘must haves’ often include a giant built-in grill with a rotisserie element and plenty of countertop space – usually crafted from poured concrete, but more often natural stone such as granite or quartzite – to each side of the grill for food prep and serving. Often, Mangold will include a built-in ice cooler as well. Many of these elements were included in a recent great room addition Mangold made to a home she designed a few years ago. Its cooking space includes a built-in grill clad in stone and accented with a ventilation hood to exhaust smoke. A few stainless steel drawers beneath the grill store barbecue utensils. Nearby is a dining table accented with a chandelier…“because we can,” she says. Additionally, a lounging area features a fireplace and television. On each side of the room, expansive 12’x8′ doors with screens complement the ceiling fan for additional ventilation. Bluestone pavers cover the floor and extend beyond the addition to the outdoor terraces, tying everything together. Outdoor kitchens are, in fact, kitchens, and as such, follow many of the same design principles as their indoor equivalents. While comparisons can be made, designers note a few differences, such as the need to consider providing shade and respite from the elements for their obvious effect on personal comfort when outdoors. “UV rays also play a large part in making the right selections for countertops, lighting appliances, storage and more,” adds Tumlin. Ventilation hoods and abundant storage, both critical components in interior kitchens, are typically less important outdoors. The former are often eliminated entirely, except in more enclosed spaces where the effects of using a grill or smoker may not dissipate entirely on their own. The latter is frequently minimized given the challenges of storing supplies long-term in a place where there is limited control over climate, insects, dirt, etc. Many of the outdoor kitchens that Amy Mangold designs are so much more than just places to cook, such as this addition that not only includes a built-in grill, ventilation hood and stainless steel drawers, but also a dining table – accented by a chandelier – and lounging area with a fireplace and TV. On either side of the room, expansive 12'x8' doors, with screens, complement the ceiling fan for additional ventilation. Bluestone pavers cover the floor and extend beyond the space to the outdoor terraces, tying everything together.